Contrary to yesterday's news, it seems like there's still life in the batteries of Steven Spielberg's adaption of the Daniel H. Wilson sci-fi novel Robopocalypse after all. "We found that the film was costing a lot of money and I found a better way to tell the story more economically but also much more personally. I found the personal way into Robopocalypse, and so I just told everybody to go find other jobs, I'm starting on a new script and we'll have this movie back on its feet soon... I'm working on it as we speak." Starring Thor and Catwoman, er, I mean Chris Helmsworth and Anne Hathaway, the story of AI intelligence and android revolt is being scripted by fan favorite Drew Goodard (Cabin In The Woods, Cloverfield). 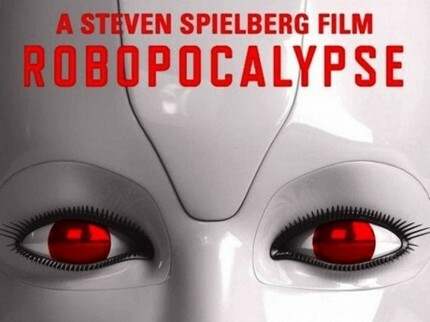 The delay in production is expected to be somewhere between six to eight months, but Spielberg promises Robopocalypse is indeed happening, and that he is "working on it as I speak". Sean Smithson contributed to this story.